The source of inspiration for Mira Terra Images - Antigua, Guatemala. I realized I've been neglectful of my own blog this very year when I should be celebrating and honoring it. Ten years ago this month, I published my first six blog posts. I think some gratitude is in order for my 10-year blog-iversary post. 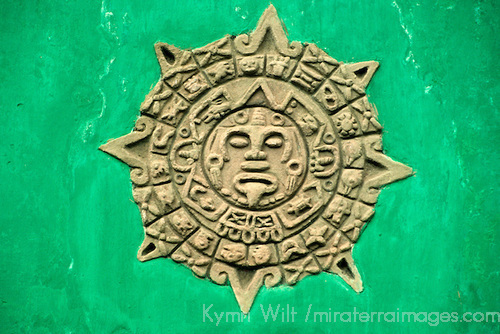 When I started Mira Terra Travel Blog, the intention was purely to drive traffic to my (first and still out there) photography website, miraterra.com. A very wise friend who was working in IT during the dot-com boom explained to me that Google doesn't find images, it finds words. So my lovely little travel photography website had launched, but was lost without words. I needed words. Baby steps, but a start, nonetheless. So this tech-savvy friend Marie (my first blog follower), read them, and reminded me that I wrote great letters when I travelled, too. Within a week a package arrived of every letter I'd written her during and since our college days, with a note something to the effect of "too good to throw out." A few years earlier, when I became a mother, my highschool friend Nina had done the same thing - she returned all my handwritten letters and postcards I'd sent her from my travels and college life, as "a gift for your daughter - family treasures." Sure, both friends were downsizing their "stuff", and respected my Cancerian sentimentality. But both friends in their own way encouraged me to keep writing, reminding me that my words had value, and put my words back into my hands to do something with. To those two friends, Nina and Marie, thank you. I'm grateful that you are both still in my life, even if handwritten letters have morphed into occasional facebook messages. The friendships remain, and conversations flow as effortlessly today as the letters that seemed to write themselves back then. Fast forward 10 years to the present, and I'm so busy writing professionally for other outlets that my travel journal posts to my own blog are few and far between. I need to change that. My humble little personal travel-photography blog, which I never once endeavored to monetize, is still here, and I still have boxes of travel journal stories to share. Which brings me to the here and now, and last night. Last night I attended a travel media event in Los Angeles, hosted by Bella Guatemala Travel. It was not a presentation or sales pitch. It was a fully immersive Guatemalan experience, with food, dancers, textile weavers, music, artists and even rum-tasting. Being there reminded me that Guatemala is really to credit for kick-starting me on my path as a travel photographer. Guatemala was my first solo trip after my mother had passed, and I just needed to take my journey; reflecting and writing through my grief, and opening my heart through my camera lens. It was the perfect destination for both writing and photography. Guatemala captivated me with colors, textiles, language, and culture. It woke up all my senses, and filled my circumstantial emptiness with a passion for recording and telling stories, and capturing and sharing images. When I returned, I subjected my closest friends to carousel slideshows of the 6 rolls I shot in Guatemala. They didn't get bored or nod off. With every passing image projected, they were drawn in, entranced, and listening to my every word. Then, a lightbulb went off for my closest friend Bil, who finally just blurted out "Kymri, you're pursuing the wrong dream. You are meant to be a photographer." Months later it was a freeflowing conversation with Bil during which "Mira Terra Images" as my brand name was born. Rooted in Latin for "See the World", it rolled off the tongue and felt right. Never mind that Spanish speakers would translate it as "Look at the earth," literally; Bil and I loved it, because together we loved the earth. So thank you Bil, for being that friend who told me what I needed to be told. You knew me better than I knew myself. A few years and travels later, I gave birth to my daughter, and shortly thereafter, to my brand. My early days with baby were spent at a desk scanning slides with her in my arms. "Antigua, Guatemala" was the label on the first box of slides I digitized when I got my scanner. 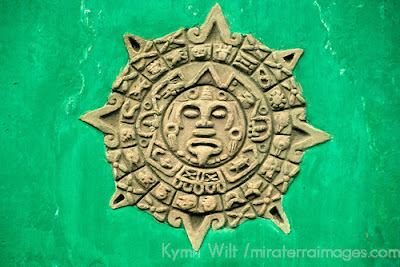 My entire brand and logo design for Mira Terra Images came from the shot at the top of this post, the Mayan Calendar on a green wall in Antigua, Guatemala. Think of the significance of that. Another thank you from this blog's earliest days, perhaps the most important one, goes out to Tom, whose encouragement, creative vision, travel marketing savvy, and above all else, friendship, helped to put Mira Terra Images Travel Photography & Services on the map of the world wide web. With his help, I became my own brand. Thank you, Tom. How lucky I've been to have the intuitive foresight, encouragement, and wisdom of friends like Marie, Nina, Bil and Tom. 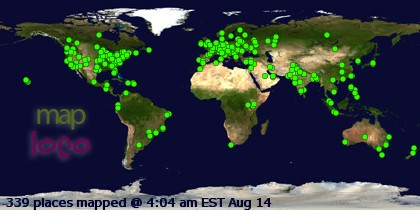 There simply are no words for the depth of gratitude I feel towards each of you. So back to last night, I found myself thinking about how significant that trip to Guatemala was for me. It was two and a half passports ago, and I was saddened to realize that my current passport, expiring this year, has no Guatemala stamp in it's 96 pages and inserts. How is it I haven't been back? I need to change that. In fact, I think this is exactly the right year, and Guatemala is exactly the right stamp to be the first in my new passport. So one final thank you for my 10-year blog-iversary post. Thank you, Guatemala. For inspiring me in my 20's, and for being a timeless inspirational presence in my realized vocation(s). I look forward to re-connecting with you, Guatemala, like an old dear friend. The kind that knows me better than I know myself. I come here after quite a while since 2016 and entire this term i have miss the chance to get information from a bonafide source you are returned this opposition which is exceptionally cheering for me.